Who tried to drown the catnip mousie in one of our water bowls?! This is NOT the best way to get catnip tea! Today I conclude my thanks for the great prezzies we received the past year thanks to Zee & Zoey (check here and here). We received a Lickety Stick, Salmon flavor. Of course, Milou and Kitshka loved it! They wouldn’t stop! Me? Hmmm, I have to say, not really. But Milou and Kitshka had no problem making up for me! On the other hand, we all liked the World’s Best Cat Litter, which also came with a scooper and… a bag!!! A BAG!!! Bags. The bestest human invention. After boxes. Do you have questions for your humans? We do! 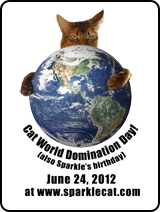 Yesterday, I was reading Daisy’s post at PetMeds Blog and I learned that today is National Answer Your Cat’s Questions Day! 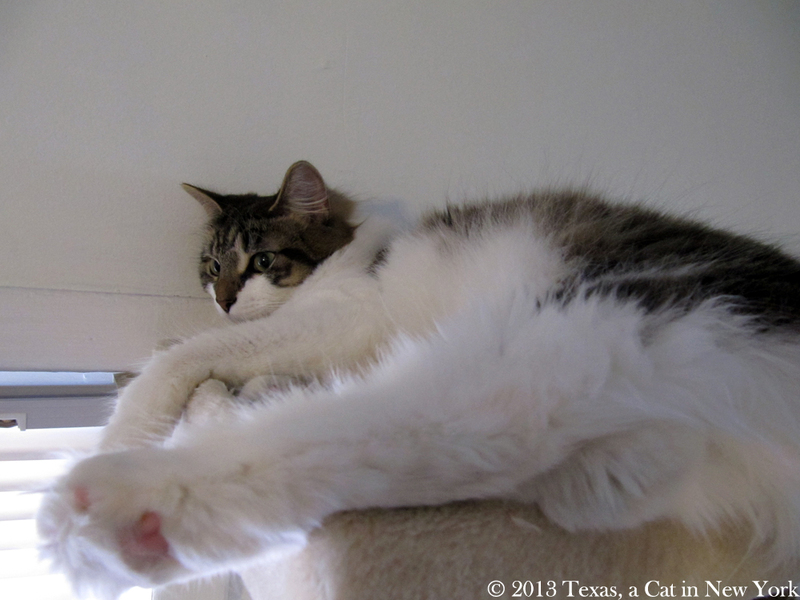 Needless to say, all three of us – Milou, Kitshka, and I – have questions for our humans! So there you go! How come I cannot eat Texas’ and Kitshka’s yummiest food? Because it makes you seriously sick, then I have to get you to the V-E-T and he performs outrageous things on your business end to fix you. Why are you feeding me only 18 times a day when I’m hungry 28 times? Because I actually have to work so I can afford your diet food among others, and get a little sleep (I don’t require 18h a day but still). I’m hungry. Can I have food now? You had food 10 minutes ago! Can the birdies outside be invited inside the house? No sweetie, they are meant to live outside. Inside, they could not fly. How come I cannot eat Texas’ and Milou’s yummiest food? Because you have your special kitten food, so that you can healthily grow into a beautiful Ladycat. 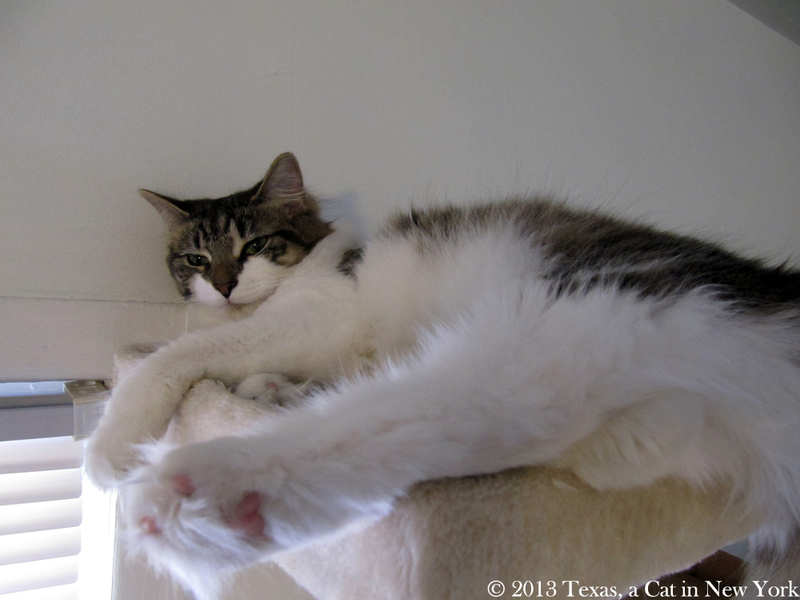 Texas is currently on diet food* and Milou has a special urinary diet. Why don’t you let the cream cheese on the table, ever? 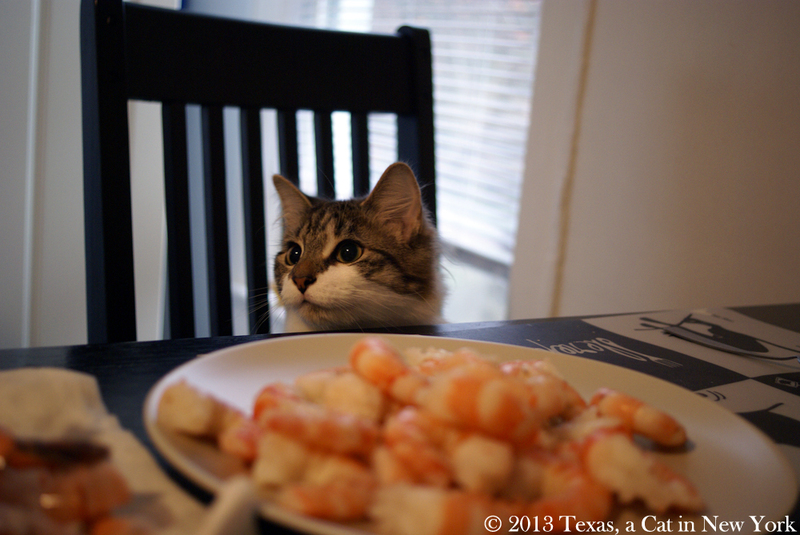 Why don’t you eat fresh shrimps more often? 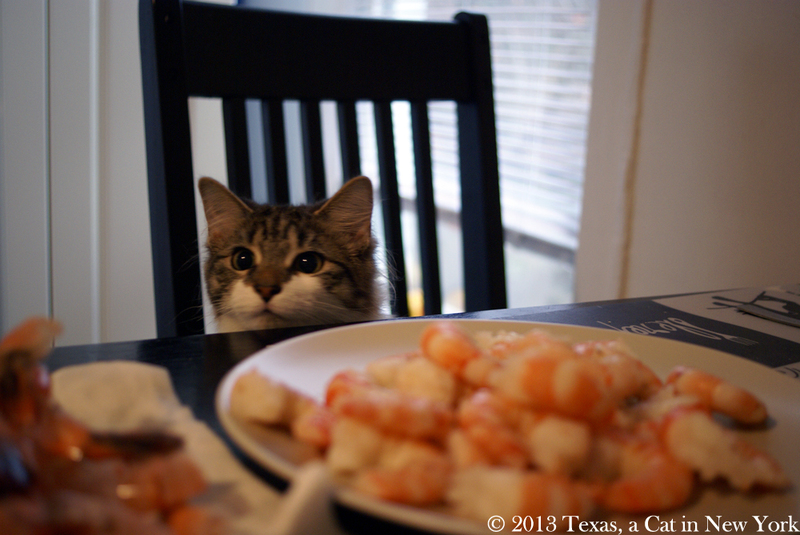 Because we don’t want to eat shrimps everyday. Why can’t we keep all the boxes you receive? I know you love boxes, Texas. And there will always be boxes for you to play with. We cannot have boxes everywhere though. We, humans, live here too, you know (not in boxes though). How come I cannot eat Milou’s yummiest food? Because Milou has a special urinary diet, he cannot eat*** anything else, and this type of food is very high in calories. * Texas: Human! You didn’t have to tell! ** Kitshka: Yeah, right. Just because I am a kitten doesn’t mean I am stupid. You just don’t want to share! Helping French furry friends and something… compelling! I hope you all had a great weekend, wherever you are! 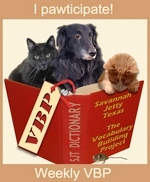 First, I want you to know that something compelling (VBP) is coming up, so stay tuned! If you haven’t read my post about Architects for Animals, you might want to check it here. Interestingly (VBP), I recently read about an initiative that has some relation to this project. 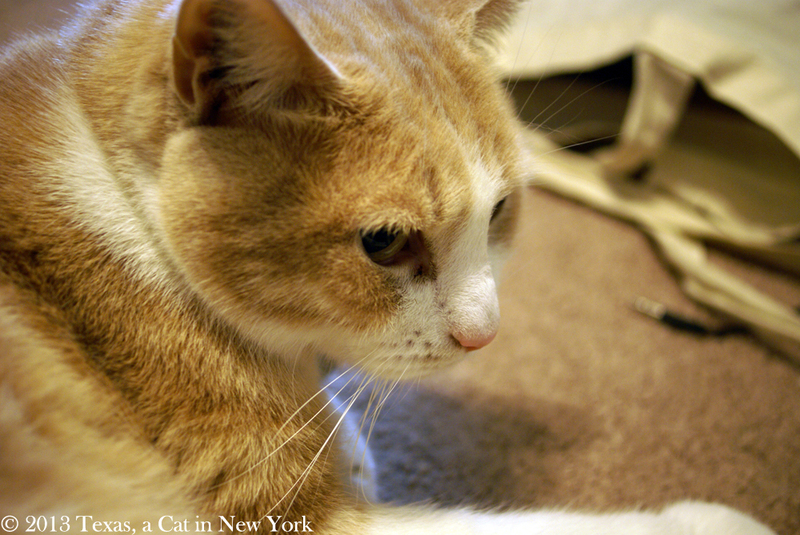 I read it at a French furriends’ bloggie Deux Chats dans ma Cuisine (Two Cats in my Kitchen) and I thought you might be interested in knowing about it and… helping. Don’t worry it is as easy as cleaning your toesies. Animal shelters’ cages are located outside, so everytime temperature falls, animals are very much exposed to cold weather. Shelters then need blankets to help warm the animals. SOS Couvertures’ goal is to help finance these blankets. Everytime someone clicks on the [clic] button (on the left) our sponsors finance 2 square centimeters (0.002 square feet) of blanket. Thank you everyone for your help. That’s right. All you have to do is click on the “clic” button. You can do this once every 8 hours. Easy as cleaning your toesies! You can see pictures of some delivered blankets here. Can you click? It will benefit French shelters, but everyone can click. 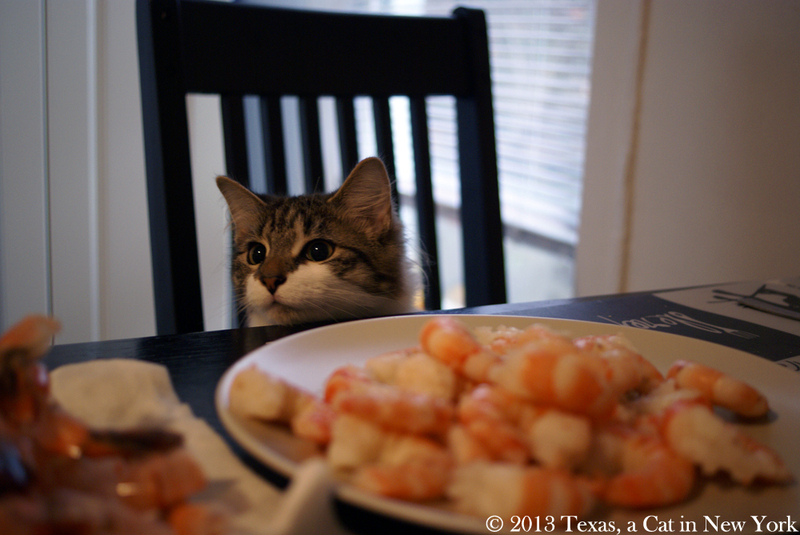 And now, I offer you pictures of Kitshka in front of delicious noms (SHRIMPS!!!) to help you start your week well. Can I have some? Can I have some?? OMC! The human is putting one into bits for us! OMC!